The Junior Speedway Racing Association of Western Australia will fire into action this weekend for the first time in the 2018/2019 summer speedway season. Ellenbrook Speedway will host Round One of the JSRA Metropolitan Series this weekend in conjunction with their Grand Final, twilight race meeting. Lady racers Elysha Cooper and Erika Vary have been the drivers to beat at Ellenbrook throughout the Winter months and will once again battle it out for the final victory of the Ellenbrook season. Tylah Steele has had a consistent Winter season and continues to develop as an up and coming star, as she looks to follow in the footsteps of older brother Jesse. Olivia Earle and Joshua Wardley have only raced a handful of meetings and continue to improve with every outing and will once again look to gain some valuable track time this weekend, while sisters Olivia and Lexi Smith will also join the field. Blake Iwanow headlines the Top Star Junior Sedan field, having dominated this season at Ellenbrook. Not only has Iwanow proven difficult to beat around the Ellenbrook venue, he has also shown his strength against some of Australias best, qualifying third for the A Main of the Australian Junior Sedan Title in Darwin and finishing second at the Northern Territory Junior Sedan Title in Katherine earlier this year. Looking to take the top step this weekend, will be Blake Webb, who had an ultra-consistent 2017/2018 speedway season. Webb has finished behind Iwanow a number of times during the winter months, will look to go one better, though will have tough competition from regular Ellenbrook racers Darryl George, Alex Swift, Jesse Steele, Ethan Cooper and Beau Oldfield. 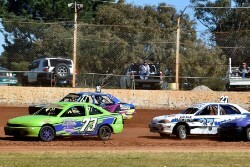 Bryden Southwell, Izak Davies and Jasmine Arnold will look to gain some valuable JSRA season points at the opening round of the Metropolitan Series this weekend, as they look forward to a big summer speedway season of Junior Sedan racing throughout Western Australia. Racing gets underway from 3pm this Saturday at Ellenbrook Speedway, which will support the opening rounds of the 360 Power Series and Late Model Pro Dirt Series.